cataclysm80 wrote: Although it's slightly off topic here, I'd also like to look at whether there are any angle differences between FWB and Foreign 4th edition. I don't expect to find any differences, but if there were some, it would be possible to positively identify the cards that are otherwise difficult to tell which set they're from. I chose these cards because they represent Commons & Uncommons, different card colors, some of them have different angles in Summer (as shown above), and the Italian FWB Library of Leng is one of the bold copyright cards. Wow! Surprisingly, Italian 4th edition uses different angles than Italian FWB. This could be a big help in determining which set a card is from, because both sets have a 1995 copyright line. The German cards use the same angles for both sets though, so some of them will still be difficult. For this thread, it's important to note that all the FBB cards we've looked at use the same angles, and all the FWB cards we've looked at use the same angles. We could reasonably expect the same results on any FBB or FWB card. I can just follow Alexis, great work! All I want to add is my interpretation of the facts. cataclysm80 wrote: Here are my Summer Magic cards and their halftone angles. I'm surprised to find a set which uses more than one combination of color angles. That's indeed surprising. If I understood right, all other sets you compared used only one combination of angles. This leads to the assumption that the two combinations for Summer Magic were an error. cataclysm80 wrote: The difference doesn't appear to be related to rarity (common, uncommon, rare). cataclysm80 wrote: The difference doesn't appear to be related to card color. Here I agree with reservations. The Summer Blue Hurricane contradicts the correlation with color, correct. But it's the only card (from our sample at least) that does, and it's a color frame misprint. It seems that the angle combinations were distributed in regard to the supposed color of each card. As Hurricane was supposed to be a green card, it received the angles used for other green cards. cataclysm80 wrote: It would seem that cards with different combinations of angles would appear on the same sheet in Summer. I think this would mean that the halftoning was done before the cards were arranged into a sheet layout. I think that if the halftoning had been done at the sheet level, then all cards on the sheet would use the same angles. I remember Dave Howell saying something about this, but in my memory it concerned only the font for the card names. The new one caused problems with foreign letters or the like. cataclysm80 wrote: I'll have to look at another set to see if it also has different halftone angles used on the same sheet. I should also look at another card, similarly to how the Blue Elemental Blast was done, to see if it has an angle change in the same place. It's definitely an interesting matter. Neuron wrote: I remember Dave Howell saying something about this, but in my memory it concerned only the font for the card names. The new one caused problems with foreign letters or the like. He said it in this thread towards the bottom of page 3. Here's a quote. snarke wrote: Edgar happened after I'd handed over the job of Production Manager to Tom Wanerstrand. However, I might be able to provide some clues. Magic cards were originally created in two layers. The border and artwork were a high resolution TIFF file. The type and symbols were an EPS that was overlaid on the TIFF. The textless 'test printing' cards look to me like the TIFF without the EPS. I think that was about the time I was helping John Jordan with the foreign editions. The 'normal' production department was totally time-committed to the English editions, so when John came back with deals for Italian, French, German, et cetera, they didn't have anybody left to actually do the typesetting and layout. I was pulled back in because my 'old' system which the 'new' production department didn't understand and didn't want to use, could handle foreign characters with very little trouble, and was blazingly fast. I interpret this as the "Magic cards were originally created in two layers" method IS Dave's "'old' system which the 'new' production department didn't understand and didn't want to use". Dave was production manager from Alpha through The Dark. Dave's "old" two layer method was great for the foreign cards because you could easily remove the EPS text layer for one language, and replace it with the EPS text layer for a different language. I don't know what the "new" system that Tom started using on Summer Magic (Edgar) was like, but it is apparently different from Dave's "old" system. I IMAGINE that the "new" system was a card creating program that used a single layer and created each card individually, similar to the modern "Magic Set Editor" software that is available for making homemade cards. Such a program may have been designed with only English characters in mind. With a single layer system like that, you'd need to recreate each card every time you changed the text. Each language would take the same amount of time to create. With Dave's two layer method, the card frame, art, & sheet layout only need done once, which saves time IF your doing multiple languages. I haven't spoken with Tom yet, but I plan to because I would REALLY like to get some artist proofs from him for my Samite Healer collection. His mother (the Magic artist Kerstin Kaman) passed away recently, so now may not be the best time to approach the subject. Hopefully the opportunity will present itself to ask him some additional questions about stuff like this. cataclysm80 wrote: It may be interesting to look at some of the sets between Revised and Summer, and also between Summer and Italian Black Border to see what angles were used on those cards. Maybe we can better pinpoint where the change took place. I think this is the correct order of products for this time frame. It appears that before Fallen Empires & FBB, only Legends and some Summer cards used the Cyan 67, Magenta 7, Yellow 172, Black 37 angles. It appears that starting with Fallen Empires & FBB, all sets used the Cyan 67, Magenta 7, Yellow 172, Black 37 angles until Italain 4th came out. I don't own any of the Test Printing test prints, but the owner of some of them was kind enough to send me scans of them for this project. The scans were jpeg instead of tiff, so there was a little data loss due to compression, resulting in the computer having a harder time accurately separating the image into the 4 CMYK colors. I had to look very closely at these and compare them to the unseparated scans to make sure that I wasn't looking at dots that the computer put on the wrong color layer. For example, yellow and red dots printed over each other on the card appear orange. When that data is scanned and compressed, the compressed version actually has orange. Then when the computer tries to separate it back into yellow and red, the orange dot may appear on both layers. Luckily, the scan showed multiple cards of different colors, so I was able to reference several different areas, and I'm pretty sure that these numbers are correct. They are all different from each other. The German / French cards use angles that are very similar to the FBB sets (which makes sense considering that most of them have text identical to German FBB), except that the yellow layer is at a 52 degree angle, which is not something that we've seen on a normal production card. The Test Printing cards use color angle combinations that we've not seen on any other cards. The 172 angle & 7 angle are numbers that we see from FBB up until Italian 4th, but those angles are normally assigned to different colors. The Test Printing cards also use a 52 angle like we saw on the German / French cards, but again it's assigned to a different color. The 22 angle is not something that we've seen elsewhere. The Textless test prints are the only ones that have color angle combinations that were actually used on normal production cards. These angles were primarily used before Fallen Empires & FBB, so these test prints are probably also from before Fallen Empires & FBB. This seems like an appropriate place to insert some info on the history of WotC color separations and dot gain adjustments. Dot gain is how much each ink dot grows when it's on the card stock. You might think of it like ink bleed. It's possible to get to much color on the card stock, and that makes the card appear very dark. I think that for the most part, dot gain adjustments are made before burning the color separations to film, but dot gain can also be affected by things like ink level, ink viscosity which can change with temperature, and print speed. Alpha WotC did their own color separations but did not adjust for dot gain. Carta Mundi performed an automated adjustment when making the printing plates, which was better than nothing but less than ideal. The cards were darker than intended. Beta WotC did their own color separations, but only burned film for the cards which needed added or corrected. Film for those few cards was sent to Carta Mundi who covered those cards on the Alpha films and burned new plates with blank spaces where the corrected cards would go. Then they went back and burned the new cards into the appropriate blank spaces. Some of these corrected cards didn't receive the dot gain adjustment, which is why they appear so much darker than other cards. Unlimited No color separations or film burned. Carta Mundi put white tape over the black borders on the existing films and made new printing plates. Arabian Nights WotC hired a company called CMYK in Seattle to do the color separations and adjust for dot gain. Antiquities WotC hired a company called CMYK in Seattle to do the color separations and adjust for dot gain. March 1994 Carta Mundi shows WotC a new card stock that is supposed to be stronger, but WotC decides not to switch. Revised The screen density (resolution) for Revised was raised to 175 LPI (Lines Per Inch). Previous sets were 150 LPI. Here's a link where Dave talks a lot about dot gain and things. WotC hired a company called CMYK in Seattle to do the color separations and adjust for dot gain, the same as they had done for Arabian Nights & Antiquities. Unlike those two expansions, Revised was a reprint set, enabling people to compare it side by side with the older cards which had been printed to dark. Many customers complained about the lighter coloring. In May of 1994, WotC sent Sandra Everingham to Belgium to work with Carta Mundi on making cards more vibrant without sacrificing print quality. art and less so on the borders that are hard to put legible text onto. The part where Peter says they have to go back and completely re-do all the pre-press work after The Dark is out of their hair is where Summer Magic (Edgar) began. Now have a look at a comparison of these different versions of Pestilence, paying close attention to the shaded areas of the text box which I've circled with red. Unlimited, Revised, & Summer all have it. Sewers of Estark & Fallen Empires cards also have it. The textless test print does NOT have it, and would have been made AFTER the above mentioned cards which do have it. 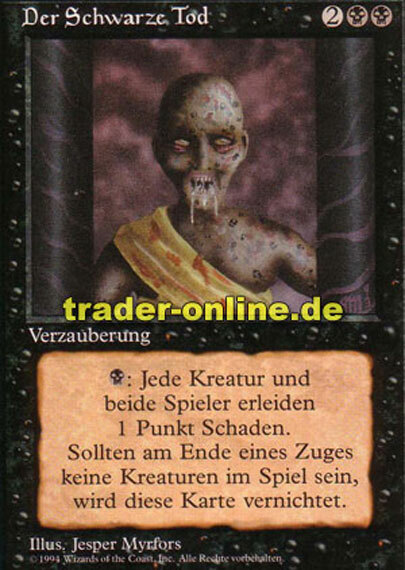 I didn't have any of the FBB Pestilence cards, but they don't have the shaded areas in the text box either. So, earlier in this thread we said that the textless test print was probably made before Fallen Empires & FBB due to the color angles, and now we're saying that the textless test print was made after Fallen Empires. With all of that supporting information, I'd say that the textless test prints were most likely made about the same time as Fallen Empires. They would have been an updated version of the .tiff file after Summer Magic was done, and that updated version was first used on Italian Black Border. I suppose you could say that these were test prints for Italian Black border, but in reality this change was intended for all subsequent sets, Italian FBB just happened to be the next set that they worked on after testing and approving this change. A random player in my local game store pointed out this text box shading difference to me back in 1996. He said that the change was done to make sure that the rules text was always readable. I would not consider him to be a good source of information, but the idea is plausible and I wonder where he heard that. Both of the other test prints and 4th edition also do not have the extra shading in the textbox. Last edited by cataclysm80 on Sun Feb 07, 2016 6:58 am, edited 1 time in total. Yes, that might be a possibility that the Hurricane Angles are different from other blue cards because Hurricane is a Green card. For that matter, we really don't know for sure what Summer Magic uncut sheets looked like, but I'd expect them to be the same size as all the other Magic sheets that were made up to that point. This makes me think about how Beta only printed color separation films for the cards that needed corrected / added. I suppose it's possible that those cards could have different angle measurements than the other Beta cards which were made with the Alpha films. If Beta does have that issue, then Unlimited would have it also because Unlimited was made from the same films. Another set that comes to mind is French FWB. Only the 11 cards with 1995 dates are updated. The rest of the cards are exactly the same as French FBB. I would bet that color separation films were only burned for the updated cards, and the old films used for the rest of the set. I've checked the Scryb Sprite though, and it does happen to have the same angles as the rest of the set. I'm also wondering if the angles of the color layers could be used to differentiate between Japanese Introductory Two Player Set & Japanese 4th, OR between Starter 2000 & 6th edition. Those Test Prints are on the same card stock as GERMAN/FRENCH COPYRIGHT TEST PRINTS . They will not pass the bend test and are slightly oversized compared to a normal card. No additional info is available for the moment. Do you have any idea for what Edition or Extension those were tested for ? Unfortunately, I do not own any of the Test Printing test print cards, so I can not comment on their card stock. My German/French copyright test prints have both passed the bend test (diagonal, corner to corner until they touch), So I'm not sure what to think about any claims that they don't pass the bend test. I still think it's best to not bend test anything. It's to risky. If these numbers are accurate, that would be .01 inches (.254 mm) taller than a regular card & also .01 inches (.254 mm wider than a regular card. It's a very small difference. The German/French test prints are .02 inches (.508 mm) taller than a regular card and the same width as a regular card. The Textless test prints are the same height as a regular card, but .02 inches (.508 mm) narrower than a regular card. To start with, here is some background information that I've pieced together from various sources (old usenet posts from Wizards employees where possible) that sort of explains how Summer Magic (Edgar) happened and what the company was going through at that time. Edgar was Tom Wannerstrands first set as production manager, and Fallen Empires was his second. Dave Howell was production manager for Alpha through The Dark, and then he worked on the foreign language stuff. Antiquities finished printing on February 20th. I'm pretty sure they started printing Revised soon afterward in order to have enough to distribute by the April 9th release date. The press making Revised would have continued to make it even after the release date. About the time that Revised was released, Legends would have showed up at Carta Mundi and began printing on a different press. Two days after Revised was released in April, Wizards was already getting a lot of complaints about the washed out coloring. People were suggesting that others not buy any Revised cards until the problem was worked out. Dave Howell (the production manager) said that it couldn't possibly be changed until new plates were made with adjusted dot gain, and they weren't scheduled to make new plates until September. A month later in May, the amount of complaints was enough that Peter Adkison made a public announcement. art and less so on the borders that are hard to put legible text onto." The new Revised plates which were scheduled to be made in September may never have actually been made because they were making Summer instead. Sandra Everingham went to Belgium to work with Carta Mundi on getting more vivid colors. Only minor adjustments could be done, but she was able to approve them without having to wait on shipping samples to the USA. Legends was released June 13th. Jyhad (other WotC card game) would have began printing on that press directly afterward. In mid July, the Revised press, which had been making cards for starter decks, would have been stopped and switched to begin making The Dark. The Dark was released August 8th, and the press it was made on would have began making Summer Magic (Edgar). Jyhad (other WotC card game) was released on August 16th. In September, Nalathni Dragon was printed with dark colors like Summer. In September, Summer was released and recalled for destruction. 120 million cards. The Fallen Empires color separations had arrived and would have been very dark like Summer and had to be redone with different dot gain settings, causing a delay. Fallen Empires began printing as soon as possible. Italian Black Border (FBB) also would have began printing in late September. Meanwhile, there was a shortage of Revised boosters because they had stopped making them and destroyed Summer which was supposed to replace them, and the presses were to busy with other stuff to make more. In late October, Italian Black border was released, and on Oct 24th the Wizards head of sales went to Belgium to discuss the Revised shortage. I suspect that press would have began making some Revised cards again to relieve the shortage. Printing these additional Revised cards would satisfy customer demand but it also caused the delay of other products like French Black Border and German Black Border because the press was busy. Fallen Empires was released in November, and the press would have continued to make it even after the release date. Around January 1995, the Revised & Fallen Empires presses would have been stopped so that they could make French Black Border and German Black border which were both released in March 1995. In summary, Wizards had a lot of customer complaints about Revised. So many that they felt the need to fix the problem. As Peter stated, the goal was to make cards with colors that were somewhere between Revised and Unlimited. When Summer did not turn out as expected, it was recalled and destroyed rather than risk upsetting the customers further. The core set (Revised) was the only place to get basic lands which were necessary for playing the game. There was concern that the game would fall apart and cease to exist if customers wouldn't or couldn't buy cards. It was VERY important to get the colors correct! Dave Howell has said in this thread "The only reason test prints would ever be done is to check something that cannot be checked in any other way, and the only thing which fits that description is "the color balance." Is it too light/dark/greenish/blueish/what-have-you." Making test prints is expensive, but it would be cheaper than destroying a bunch of cards like they did with Summer, and possibly upsetting your customers with an ugly product. Those Test Prints are slightly oversized compared to a normal card. No additional info is available for the moment. Do you have any idea for what Edition or Extension those were tested for ? According to different sources, they are supposed to be 4Th Edition Test Prints ? Actually, they're Not oversized, they are undersized. They are .02 inches (.508 mm) narrower than a regular card. Peter Adkison had publicly stated that the goal was to make cards with colors somewhere between Revised and Unlimited. Summer Magic clearly does not meet that standard, and that's why it was destroyed. Test prints are expensive, and it is extremely unlikely that any test prints were made for Summer Magic. If test prints had been made for Summer Magic, then the color problem would have been caught and fixed, and they would not have destroyed 120 million cards. I'm pretty confident that I can pinpoint the Textless test prints to September of 1994. Summer Magic is designed using a new method and sent to Carta Mundi for printing. Summer Magic is being printed. Fallen Empires is designed using the same methods as Summer Magic, and sent out to have its color separations done. A small amount of Summer Magic is released. The .Tiff background card borders are updated. To make sure they look good, Textless Test Prints are made using the same methods as Summer Magic. WotC looks at the Textless Test Prints and realizes the colors are to dark. This causes them to realize that Summer Magic is also to dark. Summer Magic production is halted and the released product is recalled because they don't want to face customer backlash. New color separations are made for Fallen Empires and sent to Carta Mundi for printing. This agrees with all of the evidence we've found earlier in this thread. The Textless Test Prints are the newer .Tiff that came into use after Fallen Empires was made. The reason Fallen Empires has color angles like the subsequent sets is that the color separations had to be redone. The original dark color separations for Fallen Empires probably used color angles like the older previous sets. WotC has just destroyed 120 million cards, and narrowly escaped making the same mistake with Fallen Empires. Should they trust the company doing their color separations to get it right on the second try for the very large Fallen Empires print run? I think it's very likely that WotC added the "Test Printing" text onto the Textless cards and tried out new color separations before committing to another large print run. The Test Printing Test Prints were probably made just before the second set of Fallen Empires color separations. We know that Fallen Empires had a problem that needed fixed before it's 360 million card print run. It's reasonable to think that they would run a test print and fix the problem right away. There were also a lot of other products scheduled that they wouldn't want to risk a problem with. I think the Test Printing test prints were also made in September of 1994 as a second run of the Textless test prints in order to fix the dark colors that Fallen Empires had before it was printed. Anyone who says that these Test Printing test prints were made for 4th edition is saying that after having problems with Summer Magic, WotC made Fallen Empires, Italian Black Border, French Black Border, German Black Border, Windseeker Centaur, the Ice Age promo cards, & Italian White Border BEFORE adjusting the colors for 4th edition. That's probably more than a Billion cards total! If you can print a Billion cards successfully, then you probably don't need to run a test print for 4th edition colors. I agree that 4th edition is just a little bit lighter colored than the previous sets, but the big color change that could have used a test print was between Summer and Fallen Empires. Here is a picture of Summer, Fallen Empires, Test Printing Test Print, & 4th edition, so that you can compare. dragsamou wrote: Textless Summer Colors Paralyze Test Print Front and Back. The colors of the Paralyze Test Print are matching perfectly the colors of the Paralyze Summer Edition Card. All the Paralyze Alpha, Beta, Unlimited, Revised have a real different color. So, the probability that Summer Test Prints exist is not to excluded, but since approximately 120 millions Summer cards were destroyed, it's quite impossible, otherwise, they will have noticed the color problem and else while testing. What should be modified in that sentence ? I agree that if Summer Magic test prints had been made, they wouldn't have needed to destroy 120 million cards. Test prints for Summer Magic don't exist. I agree that the Textlesss COLORS are the same as Summer Magic, but other features are different. Like the Textless Pestilence shown earlier in this thread, I've circled some differences in this picture. That Paralyze is definitely from the same set of test prints as the Pestilence, Raise Dead, and other textless test prints. Textless Paralyze Test Print front and back. The Textless Test Prints were made in September 1994 as slightly updated card backgrounds. They were made while Summer Magic was being printed and have the same colors as Summer Magic. Their new backgrounds were first used on Italian Edition (FBB). *Both of them have a lighter Back, all the others Test Prints after the Summer Colors ones doesn't have that lighter Back. So those are the same as TEXTLESS "SUMMER COLOR" TEST PRINTS ? YES, I think that Textless Forest also has Summer colors and is the same as the other Textless Test Prints. I think that the test print with a back on both sides also goes with the Textless Test Prints. They can't be from Unlimited. Several WotC employees have said that Unlimited did not have test prints. I know of 3 copies of one of these cards. Since the cards are made in sheets, I expect there are at least 3 copies of each of these. This list is VERY similar to the Textless Test Print list, and I suspect that it will contain all of the same cards. I'm looking for the Samite Healer & Blue Elemental Blast Test Printing Test Prints. If anyone finds them, please let me know. Again, This list is VERY similar to the Textless Test Print list, and I suspect that each list should contain the same cards. The list seems to be 4 cards of each color & 1 of each basic land. All the cards are from the Common sheet. We've only seen 3 or the 4 black cards. Maybe the missing black card is where the card with backs on both sides was at? That would make a 25 card sheet. I've compared this card list to a Revised uncut common sheet, and also to a 4th edition uncut common sheet. In both instances, these cards were scattered all over the sheet, not organized together in a block. Card text on the white border card back versions seems to be the same as the card text on the black border card back versions. 6 of these cards have text from another card on this list. The remaining cards have text from commons not on this list. I've made a list of which cards the text was from, and compared that to a Revised uncut common sheet, and also a 4th edition uncut common sheet. In both instances, these cards were scattered all over the sheet, not organized together in a block. I've not yet found any pattern to which cards received which text. We know that FBB & FWB sheet layouts were identical to Revised, even though the FBB & FWB sets used the newer .Tiff background. I can not find any reason to think that the Summer Magic sheet layout would be different. The colored border Revised test prints & Homelands double prints (front on both sides) were made using quadrants of existing sheets. You can also see sheet quadrants on the Regathering color separations & the Regathering black and white sheet prints. I've looked it over pretty thoroughly, and the Textless, Test Printing, & German / French test prints DO NOT seem to be made from a sheet quadrant. They don't match up in any way with any known sheet layouts, and a regular sheet would never have a card with card backs on both sides. Because their sheet layout does not match any known sheet layout, it is not possible to use that information to predict any potentially unseen card / text combinations like I was able to do for the Homelands double prints. However, with all of the other information that's been gathered, I think it's safe to say that we know what to expect for most of these cards. The only one I'm still unsure about is whether there is a 4th black card that we haven't seen yet, or if that's where the double backed card goes on the sheet. Some very interesting info here! Thank you for compiling it all!